The big thrust of this whole mathesis thing was to develop a graphical outline of the structure of the cosmos, both macrocosmic and microcosmic, and allow for the use of letters as vehicles of transformation between different states on the cosmic map. We decided to use the Tetractys as our overall map, and found a set of 24 paths between the ten spheres of the Tetractys. Each path was then assigned to one of the 24 letters of the Greek alphabet (excepting the obsolete letters digamma, qoppa, and sampi), and boom, we have our graphical cosmic map. Thing is, all this was experimental and an exercise in logic and extrapolation; it’s been largely untested, but it does provide a neat way to arrange the letters on the Tetractys. 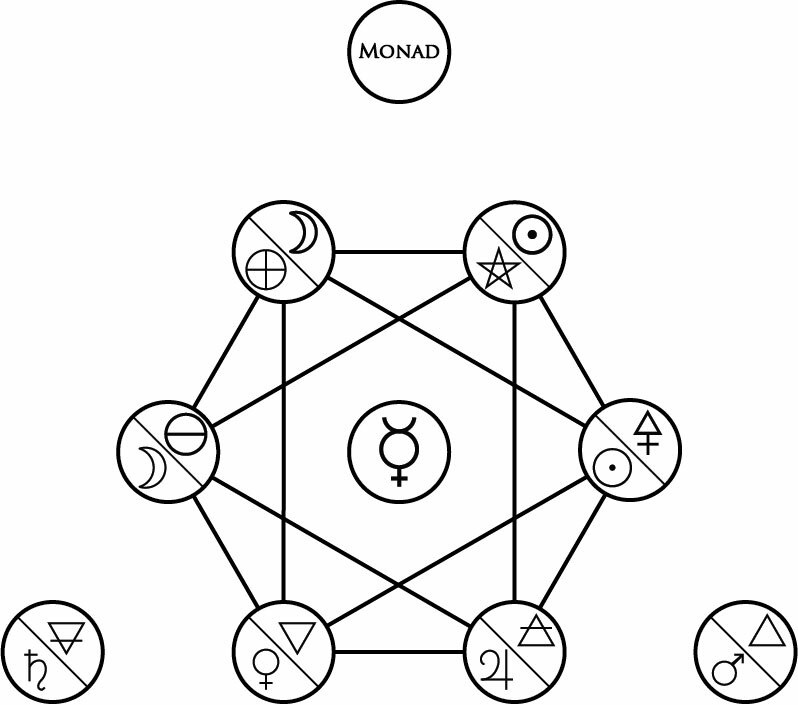 I’ve been feeling comfortable with the assignment of the spheres on the Tetractys to the ten forces: the Monad or Source, light or activity, darkness or passivity, alchemical sulfur, alchemical mercury, alchemical salt, fire, air, water, and earth. Mapping these forces to their cosmological equivalents, likewise, was fairly straightforward. What I haven’t been completely comfortable this whole time with, however, was the assignment of letters to the paths themselves. I’ve guessed from the beginning that, no matter how logical my original assignment was, chances are it wasn’t going to be a permanent assignment. I all but definitively knew that at least some of the letters on the paths were going to change, and I’d leave it to until I actually got around to exploring the Tetractys through ritual and scrying to change them. Somewhat ahead of that predicted schedule, however, I asked Hermes and asked for some guidance about the upcoming trips on the Tetractys paths, but unfortunately he was unusually tight-lipped; this was definitely something I would have to explore when the time came. He did say he’d help open some doors in the meanwhile to help me get a feel for what’d be coming up, however, so I went back and took another close look at what I’ve been discussing since I first laid out how I assigned the letters to the paths. This time, however, I kept the distinction of direction and the Gnosis/Agnosis Schemata in mind, and started over from there. I ended up with a wholly new way to assign letters to the paths and, although I’m still feeling a little unsure, this has a much different feel than the first arrangement, and it’s one I conceptually like more. I warn you, in this post I’m going to be using lots of gaudy color, and since we’ve already been through this kind of analysis once before, I’ll be a little more rough when explaining things. Consider that the Gnosis Schema is an orderly array of paths, a sequence that follows a strict ordering. The Agnosis Schema, however, has no such inherent order, and has criss-cross of paths that allow for wandering around without a plan, so to speak. If we start with these two ideas, we have two sets of twelve paths. We have 24 letters, which are divvied up between four elements, the meta-element Spirit, seven planets, and twelve zodiac signs. We can divide the letters and their corresponding forces, likewise, into two groups of twelve: the twelve zodiac signs/simple consonants, and the twelve forces/vowels and complex consonants. The zodiac signs follow a particular celestial order, and while we can ascribe orders to the elements based on density or planets based on distance from Earth, we also recognize that the elements shift among themselves and the planets move around from place to place. There are two sets of forces: zodiacal and energetic. Zodiacal forces are the 12 signs of the zodiac, and the energetic forces are the four elements, the meta-element spirit, and seven planets. There are four elements of the forces: fire, air, water, earth. There are three modes of the forces. In the zodiac forces, these are manifested as cardinal (Aries, Cancer, Libra, Capricorn), fixed (Taurus, Leo, Scorpio, Aquarius), and mutable (Gemini, Virgo, Sagittarius, Pisces). In the energetic forces, these are manifested as the ideal (the four elements Fire, Air, Water, Earth), the empyrean (the planets of the Sun, Mercury, Moon, and spirit considered as a planet), and the ouranic (the planets of Venus, Jupiter, Mars, and Saturn). We can link the ideal mode of the energies to the fixed mode of the zodiac signs, the empyrean to the cardinal, and the ouranic to the mutable. There are four groups of three zodiac signs and four groups of three energies based on element. 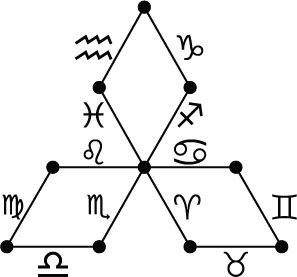 There are three groups of four zodiac signs and three groups of four energies based on mode. There are thus six forces (three energetic and three zodiacal) for each of the four elements. There are thus eight forces (four energetic and four zodiacal) for each of the three modes. 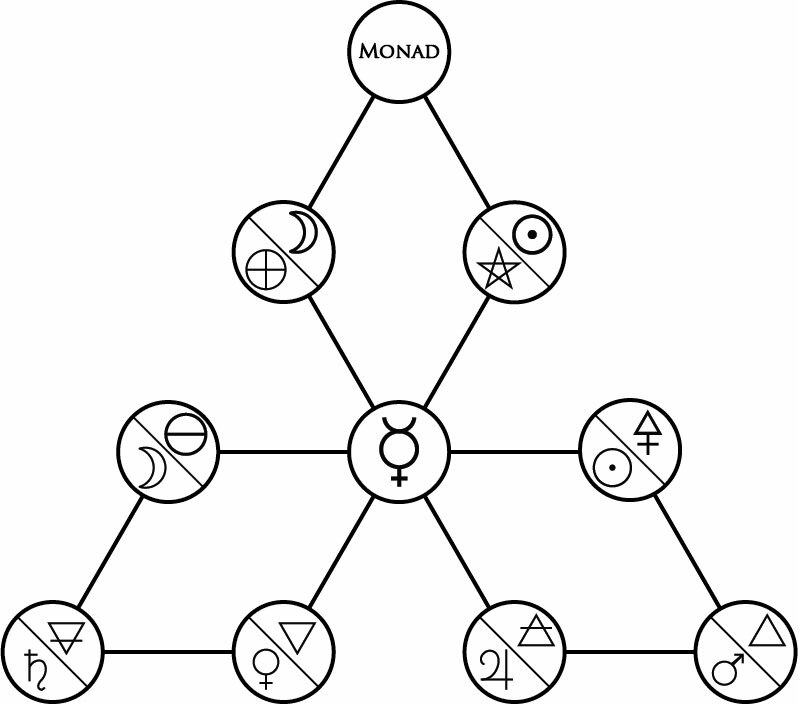 We know what the letters and their corresponding forces look like for the Gnosis Schema, and we can use that to help guide us with a bit of geometrical innovation to figure out what the paths on the Agnosis Schema should be based on the geometry of element and mode. The Fire and Water signs both emanate out from the central sphere of Mercury, while the Air and Earth signs emanate out from the three extreme spheres of the Monad, Fire, and Earth. 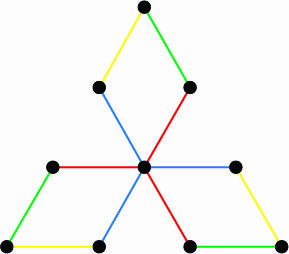 Note that if we look at the Fire set of signs and Water set of signs separately, we can draw an equilateral triangle that connects the outer points of their paths. These would give us another three paths for both the elements of Fire and Water to complete the set, which forms the hexagram in the center of the Tetractys, a symbol renowned as the mark of combining fire with water. Note the interplay of elements for the paths with this. 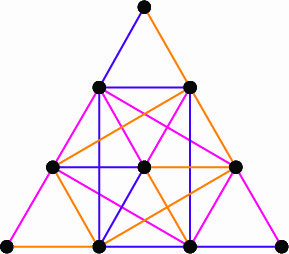 The central hexagram joins Fire and Water together, with one triangle belonging to Fire and the other to Water, and if we include the zodiacal paths that connect the vertices of the triangles, we end up with a 2-dimensional birds-eye look of two interlocked tetrahedrons, one pointing up (Fire) and one pointing down (Water). 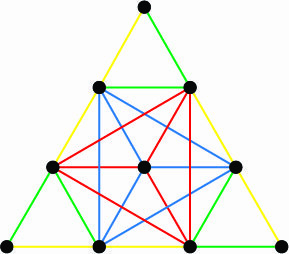 The hexagon around the hexagram alternates Air and Earth, and with the six zodiacal paths inside the hexagon, we end up with a 2-dimensional view of a cube facing one of its corners, with its 12 edges bounded by the elements four times each. Each of the elements comes in contact with all the other elements at least once each by means of the paths on the Tetractys, forming a completely yet regularly mixed whole. Ideal energies are the pure elements themselves, their most high and abstract concepts and overall form to which the other energies are associated. These are the four elements of Fire, Air, Water, and Earth. Ouranic energies are the four forces of Mars, Jupiter, Venus, and Saturn. These are the other four planets that are represented in the Tetrad rank of the Tetractys, and associated respectively with Fire, Air, Water, and Earth. Unlike the empyrean forces, the ouranic forces (also meaning “heavenly” but in a sense closer to “celestial” rather than “divine”) are not planets associated with the process of alchemy, but planets associated with the materials of alchemy, the four elements. They’re in a sense “lower” than the four empyrean forces. Overall, I like this version of the Tetractys more; it has a different “ring” to it, something a little clearer and smoother, but I’m still unsure as yet whether it’s the right one. Only exploration and testing will show that out, and whether any adjustment (or outright rewriting) is needed. What’s interesting, though, is how this might affect our exploration of the Tetractys in a structured way. Note that we’ve assigned the Gnosis Schema paths to the twelve signs of the zodiac. The Zodiac is the belt of stars that the Sun and all the other planets travel through over the course of their orbits, and we make one revolution through the Zodiac every year. Thus, we have a sort of solar schedule for how we travel through the paths: for instance, we make the trip between Mercury and Air during Aries, Air and Fire during Taurus, Fire and Sulfur during Gemini, Sulfur and Mercury during Cancer, and so forth until we end up back at Mercury while we’re in Pisces. The association of the Zodiac with the Gnosis Schema paths, further, divides the year up into three periods, one for each of the Initiatory Cycles as mentioned before. the first four signs (from the start of Aries to the end of Cancer) to the Hot Initiation (Mercury, Air, Fire, Sulfur); the second four signs (start of Leo to the end of Scorpio) to the Cold Initiation (Mercury, Salt, Earth, Water); and the last four signs (start of Sagittarius to the end of Pisces) to the Cosmic Initiation. Of course, this is slightly adrift from our notion of having four seasons of spring, summer, autumn, and winter, but we do go from a period of cold to hot (heating the year), a period of hot to cold (cooling the year), and a period of just cold (darkest and coldest point of the year). It’s not hard to make associations between these three quasi-seasons with the three Initiatory Cycles, but of course, my living in the Northern Hemisphere is coloring my views somewhat. Of course, I don’t think we need to follow the Sun in the Zodiac as we follow the paths in the Tetractys, but it does imply that there’s a natural flow, a cycle that’s inherent in the mechanics of the cosmos. Consider the three empyrean planets of the Sun, Moon, and Mercury: the Sun only ever goes in one direction through the Zodiac, as does the Moon; Mercury does go retrograde fairly often, but its retrograde periods are also extremely short compared to all the other planets, and is so close to the Sun that it basically is taken along with it. Spirit, the other empyrean energy, is both lower than and amidst the planets themselves, providing the space and nature for them to exist and coexist at all. Between the Sun, Moon, and Mercury, there’s a natural flow that pretty much only ever goes in one direction, and that’s around the Zodiac in its proper order. As the Sun and Moon pretty much define nearly all the natural cycles down here on Earth, it suggests that there’s a natural flow and pull for ourselves to be taken along the Gnosis Schema ever onwards towards gnosis and henosis. However, we get trapped and caught up by the forces of the other planets and elements, which gets us tangled up and going against the natural flow and rhythm of the Gnosis Schema. We get swept up in a particular planet’s influence, we get brought down by a particular element’s effects, and we generally get caught up in long periods of retrograde motion and muddled manifestation of forces that keep us from flowing naturally with the cosmos as we should. In aikido terms, the more stressed we are, the less ki can flow through us; in quasi-Thelemic terms, the more we focus on our temporary will, the less we naturally enact our True Will. If we could simply incorporate the powers of the planets and elements without being subsumed or dominated by them, we could live with the natural flow of the cosmos to attain our true destinations and ends. Of course, because of the various influences shining down upon us and emanating from within us, we have to struggle to constantly align and realign ourselves with the natural flow of things. We have to constantly be on guard so that we don’t fall from Gnosis back to Agnosis; we have to constantly keep ahead of the ghost of Argos so we don’t become trapped once more. First of all, in the resolution of the material body, the Body itself is given up to alteration, and the form which it had becometh invisible; and the idle manners are permitted, and left to the Demon, and the senses of the body return into their Fountains, being parts, and again made up into Operations. And Anger, and concupiscence, go into the brutish or unreasonable nature; and the rest striveth upward by Harmony. And to the first Zone [planet] it giveth the power it had of increasing and diminishing. To the second, the machinations or plotting of evils, and one effectual deceit or craft. To the third, the idle deceit of Concupiscence. To the fourth, the desire of Rule, and unsatiable Ambition. To the fifth, profane Boldness, and the headlong rashness of confidence. To the sixth, Evil and ineffectual occasions of Riches. To the seventh Zone, subtle Falsehood, always lying in wait. 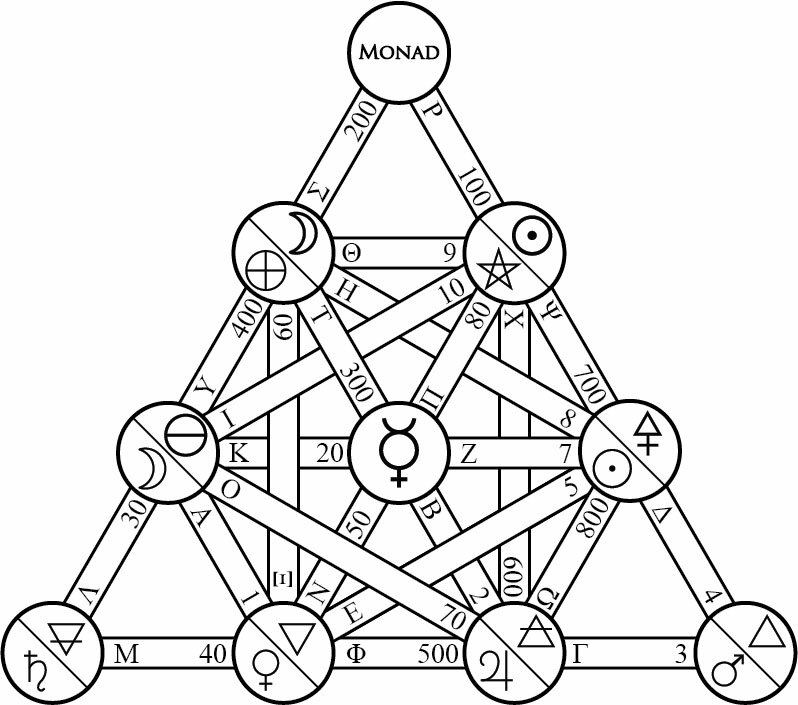 And then being made naked of all the Operations of Harmony, it cometh to the Eighth Nature [sphere of the fixed stars, realm of the Zodiac, etc. ], having its proper power, and singeth praises to the father with the things that are, and all they that are present rejoice, and congratulate the coming of it; and being made like to them with whom it converseth, it heareth also the Powers that are above the Eighth Nature, singing Praise to God in a certain voice that is peculiar to them. And then in order they return unto the Father, and themselves deliver themselves to the Powers, and becoming Powers they are in God. This is the Good, and to them that know, to be desired. Thus, while we’re trapped in this world, we cycle chaotically and confusedly around the cosmos without real understanding of how it works, no matter how much we jive with the planetary and elemental forces. It’s only once we recognize them for the powers that they are that we break free of them, traveling among the fixed stars themselves. Even in agnosis, there is learning; we need to be aware of what the elements and planets do to us before we can truly break free of them and shed ourselves of their influence. Once we know how to work them and how to get rid of their influence while remaining in control of them, we then proceed to rise above them to gnosis and understand what the whole cosmos is really about. Planetary and elemental magic can only get us so far; they cannot get us to the most extreme parts of the cosmos (or, in this model, the outermost spheres of the Tetractys) nor can they get us to a point where we’re balanced and able to go in any direction we want (the sphere of Mercury). It’s only by making the leap from agnosis to gnosis that we can do that, but even then, we must be on our guard; we can slip and fall back into agnosis by dwelling too much on any one energetic force, allowing it to entrap us once more. Personally, though I don’t expect this to be the final draft of the Tetractys with lettered paths, I think it’s definitely an improvement, and unless Hermes opens up any more doors in the meanwhile, I expect this to be the system of letters and paths that I’ll use. If nothing else, it goes to show that there really isn’t just one way to attribute letters to the paths; then again, without having come up with the notion of the Gnostic/Agnostic Schemata, this set of lettered paths wouldn’t’ve been possible. Still, even using the Schemata as our base, we could still attribute each cycle of Initiations to one of the three groups of energetic forces instead of the zodiac signs, perhaps by giving the empyrean energies to the Hot Initiation, the ouranic energies to the Cold Initiation, and the ideal energies to the Cosmic Initiation. There are many ways to arrange the paths systematically, so it’s unclear without testing it to see which one works best, if any at all even really matter. To that end, let’s see how well this particular system can be used.